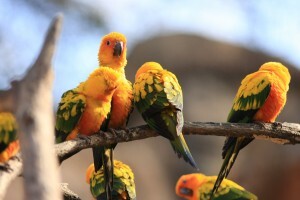 The sun conure derives its name from the brilliant shades of orange and yellow in its plumage. They are small, playful birds that are found in the northeastern part of South America. Their diet in the wild consists mainly of seeds, flowers, buds, and fruits. Sun conures are very popular in the pet trade despite their loud, screeching calls that are similar to the much larger macaws. Conservation Status: Although their population is considered stable, there is still a significant loss in the wild population due to the pet trade. Sun conures are very family oriented and will often assist other parents with raising their young.